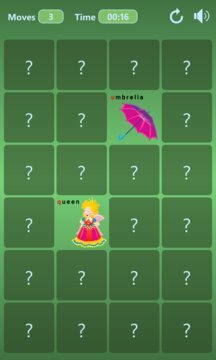 Alphabet Match Plus is a fun and educational game that combines a popular memory pair matching game concept with an easy-to-learn approach to memorizing the alphabets of various languages. With Alphabet Match Plus you can relax with the simple pair matching mode or you can choose an advanced "letter to word" option to practice memorizing foreign alphabets, letters, and words. Alphabet Match Plus is suitable for little children who have just started to learn letters, as well as adults who want to pick up basic knowledge of foreign languages. With the help of text-to-speech technology you can even learn the sound of foreign words and letters! 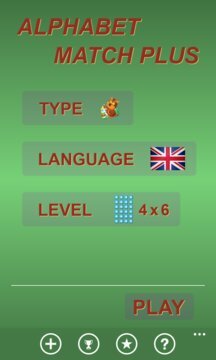 The unique design of Alphabet Match Plus has been proven to be an effective and efficient way to quickly learn the basics of foreign languages. And it is free game! - Text-To-Speech technologies provides an easy and effective way to learn how the foreign words sound. - Great ABC for Kids! Alphabet for Children!